George was born in Heaton on 12 January 1892 to Joseph and Elizabeth (nee Kirkham), the fifth of 14 children. The family moved around quite a lot, first to Meerbrook, then to Rainow and Macclesfield before ending up in Wincle around 1903. They farmed for several years at The Whim (present day Broomhill) but by 1911 they were at Bennett’s Hill and were still there during the war. As well as moving house the family seemed to change their church allegiance– the early children were baptised C of E in Rushton, Meerbrook and Rainow, the middle three together on the same day in the Wesleyan in Chapel on Sunderland Street in Macclesfield and the last ones C of E again in Wincle. 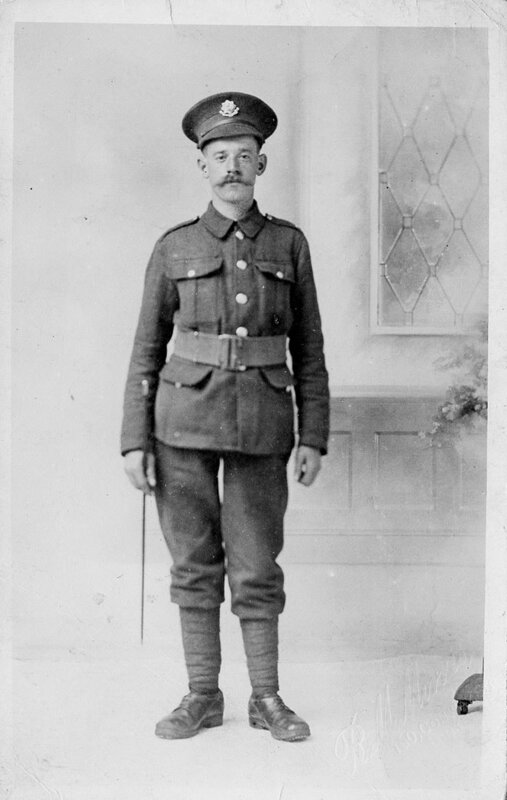 In 1911 George was helping his father at Bennett’s Hill and it was from there he signed up for the army. George volunteered on 13 Dec 1915, was mobilised on 18th February 1916 and allocated to the 3rd Battalion of the Cheshire Regiment with service no. 35357. This battalion was already in existence at the start of the war as a training unit, it remained in the UK, supplying a steady flow of replacements for troops killed at the front. He was discharged in April 1919, having been diagnosed as 40% disabled with cardiac dilation and given a pension of 11 shillings a week (to be reviewed after 26 weeks). He was awarded a Victory and British War Medal. After the war George continued working for his father, as a shepherd. The family lived at Lower Nabbs in Wildboarclough for many years. George died in Macclesfield Infirmary in June 1953. He had been living again at Broomhill Farm, Wincle. George’s brother Sydney also served in the war and is remembered on the Wincle Memorial. ’No Labour, No Battle – Military Labour during the First World war’ by John Starling and Ivor Lee.